Yoga is the perfect opportunity to practice acceptance. One of my biggest lessons over the years has been learning to accept what is. When I first began on my own personal development journey, I remember hearing the phrase “what you resist persists” which has stuck with me ever since. It’s so true! Any time you catch yourself saying to yourself; “this isn’t fair!”, “it’s not supposed to be this way!”, “why does this always happen to me?” and so on, you are in a state of resistance. Resistance simply winds you up, it creates tension in the mind and body, and it persists. One of the things I love about yoga is that it teaches us self-awareness; how we are on the mat is a good indication of how we are in life. Yoga is a perfect opportunity to practice acceptance, of being with what is, which can then spill over and benefit you throughout the rest of your life. For example, when practising Paschimotanasna, sitting forward-bend, do you try to force yourself forward to get your nose as close to your legs as possible or to reach your toes? Do you over stretch through the shoulders to reach yourself forward or are you focused on folding from the hips with an open chest, stopping when you feel your spine start to round? Whenever we try to force our body into a pose before it is ready we simply create tension, resistance. With yoga, the notion of “no pain no gain” is not at all applicable! Forcing a pose before your body is ready is likely to lead to injury. Instead, practice acceptance. Acceptance of where your body is today, go as far as you can to your edge and then breathe. The exhalation will help to naturally soften your body into the pose. Our bodies are constantly changing, as in life. How your practice is today may be completely different to yesterday. I have experienced this with a long term back problem. Every now and then, my lower back seizes up and I have to put aside my usual yoga practice for something that helps to just release the muscle spasms, which is usually just lying on the floor with my knees bent. It can then take a month to restore my hamstrings back to how they were before, and for that, acceptance is vital. If I were to resist and try to force my practice, it would just prolong the pain. Of course, it isn’t just the state of our bodies to accept, though; it’s our thoughts, our feelings and our circumstances in life. The miracle of acceptance comes when we allow ourselves to be with whatever we are feeling or is going on around us. My experience of allowing myself just to sit with a painful feeling is that it dissipates far quicker than when I resist it, trying to hide it away. Acceptance is not rolling over and becoming a victim. It about loving yourself, treating yourself with care and getting yourself into a peaceful state so you can then think clearly about what is going to be the most nurturing thing for you to do next. 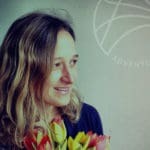 Louise is a yoga teacher, reiki healer and life coach based in Hove. She teaches regular classes, 1-1s, monthly workshops, and retreats. To see Louise’s upcoming retreats, click here.